Sliding over the end of the month with a couple of days to spare, I have a third entry for the Sewing Double challenge from the Monthly Stitch! It also only just qualifies as a #Sewcialist project too. April was the month to sew with pink, but as that colour doesn’t present itself around this house very often, a light blush sort of pink will have to do! The fabric used is one of the pieces I got my husband to buy me from John Lewis in January. I was determined it would not end up in the silk stash box, so the two pieces have been languishing on my sewing table, taunting me into making them up! 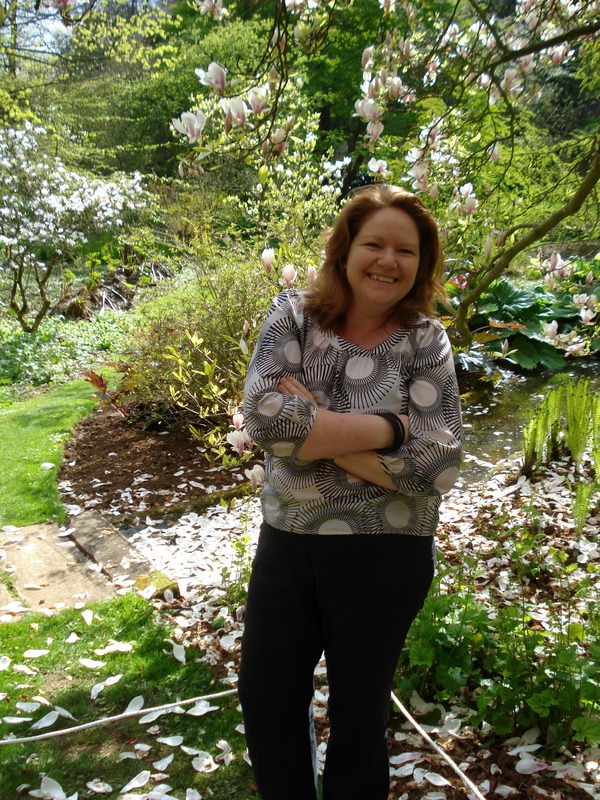 Trying to look model-like in the gardens at Upton House with a whole bus load of tourists coming up the path! 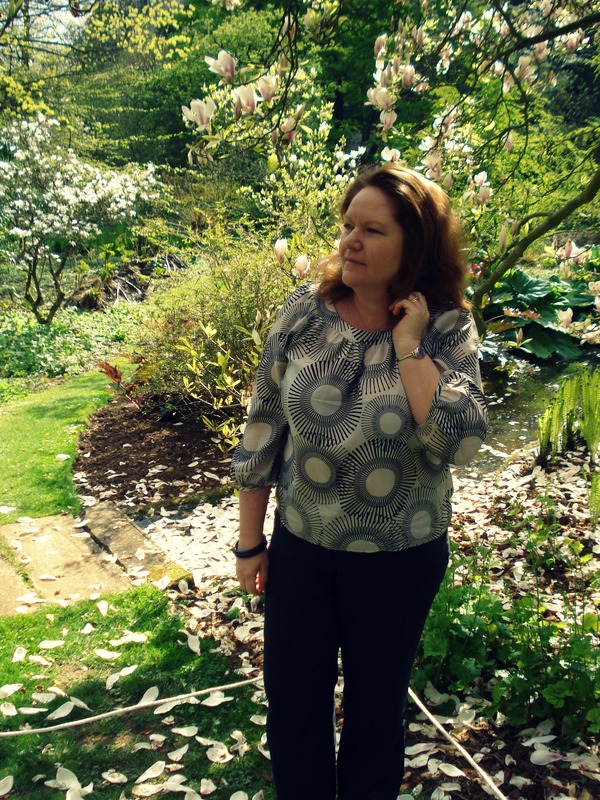 I didn’t use a self drafted pattern for this fabric – it’s a well used, tried & tested Burdastyle one. 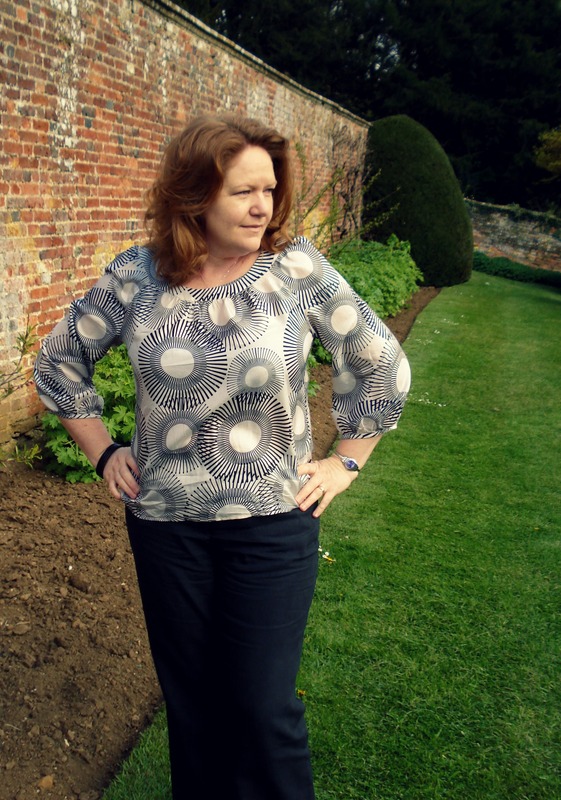 Style 138 from August 2011 has been made 4 times already, and I do love the shape & of course, the sleeves! 🙂 I also love how quickly it can be made, even when French seaming the entire thing. I only made two alterations – one is the length. The pattern in the magazine is 10cm longer. There is no reason to exaggerate my short legs, so I lopped that off the paper pattern when I made the first one & have stuck to the revised length. The other alteration was not to have the bias-trimmed opening at the back neck. The neckline is wide enough to pull over your head without it, but I did keep the separate back yoke with rouleau loops because I’d found the perfect vintage glass pearl buttons in the button basket at a charity shop! 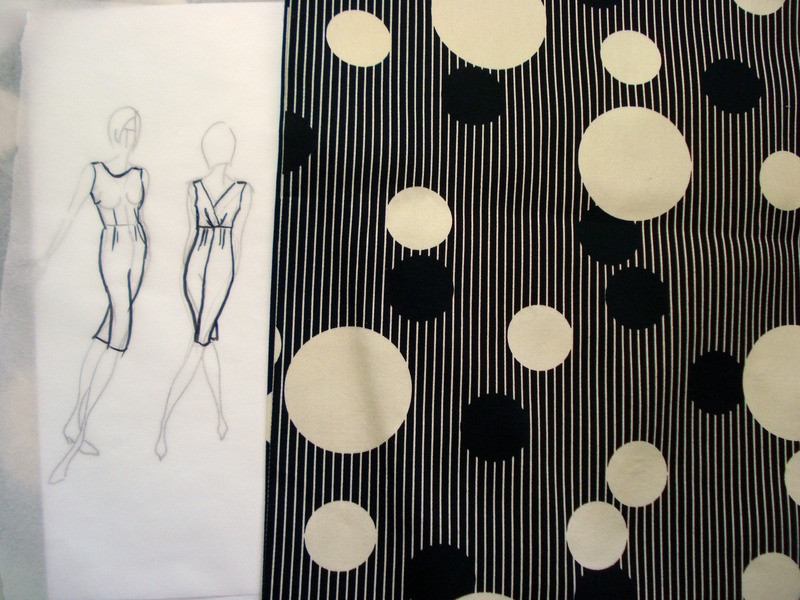 Sketch for a 50s inspired wiggle dress & the fabric – stashbusting! I really must get cracking on those toiles, but I got inspired by a mad print in my stash box & decided to do a little vintage sewing with it. You’ll have to see Vintage Belle to see what I’m up to! What a fabulous top! I’ve loved all your versions but this is my favourite. I think it’s the colours and those beautiful buttons! Thanks Vicki, I think I’ll be making this pattern for a long time, it lends itself to so many pretty fabrics! Fabulous! And well done on keeping it out of stash – it’s a lovely top and those buttons are gorgeous. 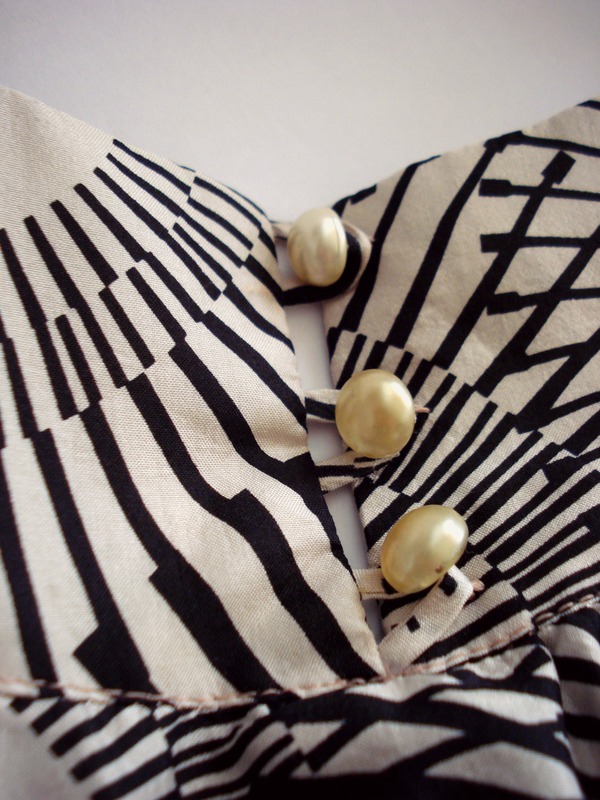 Atomictastic, the fabric is lovely and goes so well with these gorgeous buttons. It looks really good on you! This is my favourite version too, and the polka dot one. I think it was a good idea omitting the opening in the back 🙂 Well done!! Very pretty! I especially like the glass buttons a lot. Thank you! The buttons were a fab find in the charity shop! Thanks! I wish I’d got more of that black stripe & spot, it was fabulous to work with. I’ve also loved each version of this top. Is it a pattern or self drafted?